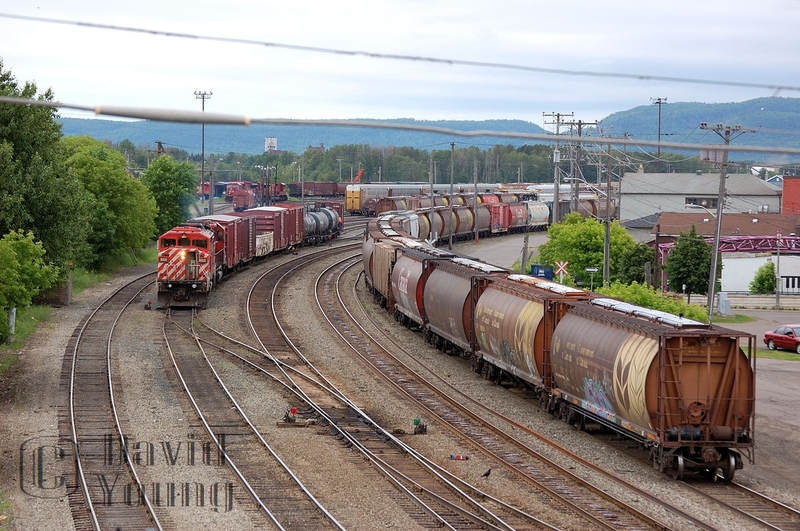 Railpictures.ca - David Young Photo: Time Machine. When compared to sdforty’s image from 1986 the infrastructure may appear vastly unchanged, however don’t be fooled. The “Shed Lead”, once used as the track for the Canadian to pull through is used now mostly for “block swaps” (lifts and setoffs). The little spur off the Shed Lead still remains in the picture, although it is out of service as with most of the spurs which serviced all the businesses along Hardisty Street. In this version, the East Wayfreight, train 434, Thunder Bay to Toronto pulls its small train out of E yard, sitting in pretty much the exact spot as the little switcher in sdforty’s image. This wayfreight would be abolished within the year, with other mainline freights picking up the slack between the two points.Another difference, the stone shop to the left of sdforty’s image does not exist in this image. The building would be a victim of a fire at some point, I believe before the 1990′s. A few more notes: the auto racks then and now are seen, there are no vans present at the shops anymore, instead replaced with SBU’s (note the one laying beside the crossover switches) and as with many other places, the foliage has grown up! | Railpictures.ca – Canadian Railway Photography – photographie ferroviaire Canadienne. When compared to sdforty's image from 1986 the infrastructure may appear vastly unchanged, however don't be fooled. The "Shed Lead", once used as the track for the Canadian to pull through is used now mostly for "block swaps" (lifts and setoffs). The little spur off the Shed Lead still remains in the picture, although it is out of service as with most of the spurs which serviced all the businesses along Hardisty Street. In this version, the East Wayfreight, train 434, Thunder Bay to Toronto pulls its small train out of E yard, sitting in pretty much the exact spot as the little switcher in sdforty's image. This wayfreight would be abolished within the year, with other mainline freights picking up the slack between the two points. Another difference, the stone shop to the left of sdforty's image does not exist in this image. The building would be a victim of a fire at some point, I believe before the 1990's. A few more notes: the auto racks then and now are seen, there are no vans present at the shops anymore, instead replaced with SBU's (note the one laying beside the crossover switches) and as with many other places, the foliage has grown up!